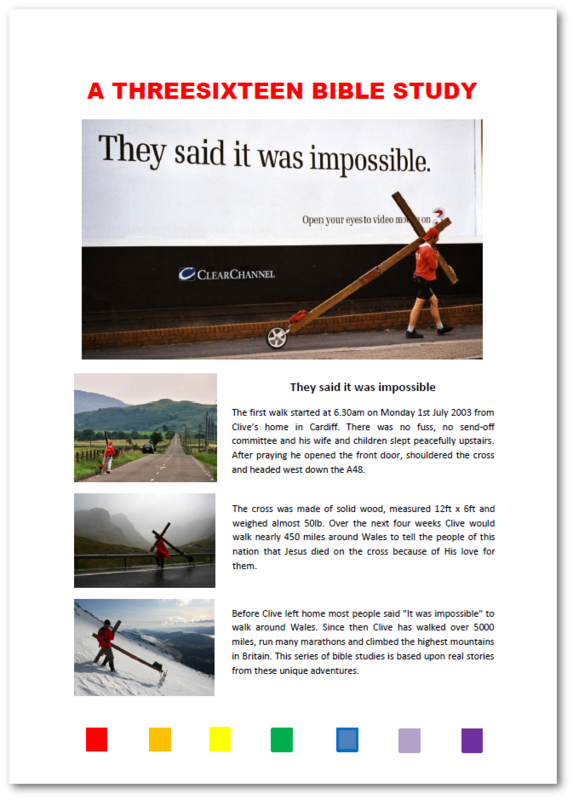 They Said It Was Impossible is a series of Bible studies based upon Counties evangelist Clive Cornish’s inspirational adventures walking, climbing and marathon running with a 12×6 foot wooden cross. Stunning photography captures the excitement of these unique journeys while engaging narrative and relevant Bible passages develop themes inspired by real events. They said it was impossible is series of four Bible studies. Study 3 is titled “Faith”. The Bible study is designed for individual and group use and can be downloaded to a computer, laptop, tablet or Smartphone. The study is introduced by Clive through a video, followed by introductory questions, Bible passages and study questions which help explore the text. A final short video highlights relevant points, applies the lessons to life and draws the study to a conclusion. An accompanying booklet is also provided – if desired the booklet can be printed. The multimedia studies were well received when employed in small church groups and a prison Bible study. In study 2 of the Bible study series “They said it was impossible,” we explore the topic of faith. We look at Matthew chapters 14 and 18 and the response of the disciples when their faith is challenged. We see Peter recognises Jesus as Lord and how, when Jesus calls him, he climbs out of the boat and with his eyes fixed on Jesus walks over the water. However, we see when Peter takes his eyes off Jesus, looks at the waves and feels the wind he loses faith. His faith does not remain strong and he begins to sink into the turbulent sea. In this study we consider how Jesus calls each one of us. Ask when Jesus calls us “out of our comfort zone”, are we prepared to go and look at how God told Clive to follow Him through faith. We see Jesus enabled Peter to walk on water, Jesus enabled Clive to walk with the cross and Jesus will enable us to do the impossible as long as we have faith and keep our eyes on him.